Authors: Jamal Uddin, A. F. M., Shamsuzzoha, M., Nusrat, A., Taufique,T. & Mehraj, H.
Authors: Mondal, S & Borromeo, T. H.
​Abstract: The study was conducted at International Rice Research Institute (IRRI) to assess the response of dry season hybrid seeds including parental checks FL478 and NSIC Rc222 to salt tolerance (12 dS/m) at the seedling stage of rice using IRRI screening techniques. The total number of seeds were two hundred thirty-one and irrigated, flood prone, heat tolerance, salinity and problem soils, aerobic and anaerobic germination, rainfed lowland and South Asian samples were used for this experiment. Among them, only 1.73% populations (4 irrigated) were identified as tolerant, 18.18% moderately tolerant, 37.26% sensitive and 46.86% were highly sensitive. Moderately tolerant plants were found from irrigated, flood prone, salinity and problem soils, aerobic germination, anaerobic germination and rainfed lowland and South Asian genotypes. As there was Brown Plant Hopper (BPH) infestation in this experiment, the tolerant genotypes may also be tolerant to BPH and for that reason results were distorted for other genotypes. Therefore, study should be conducted under controlled environment to ascertain the level of salt tolerance of the moderately tolerant populations. Besides, the identified tolerant genotypes (4) should be further tested with 18 dS/m to determine their supremacy to salt tolerance at the seedling and reproductive stages and QTL analysis could be performed to determine the effects of each genomic region of the trait of interest. Mondal, S & Borromeo, T. H. (2016). Screening of salinity tolerance of rice at early seedling stage. Journal of Bioscience and Agriculture Research, 10(01), 843-847. Mondal, S & Borromeo, T. H. "Screening of salinity tolerance of rice at early seedling stage". Journal of Bioscience and Agriculture Research, 10.01 (2016), 843-847. Mondal, S & Borromeo, T. H. Screening of salinity tolerance of rice at early seedling stage. Journal of Bioscience and Agriculture Research, 10, no. 01 (2016), 843-847. Abstract: A field experiment was conducted to evaluate the integrated effect of cow dung, poultry manure and water hyacinth with chemical fertilizers on the growth and yield of Boro rice (cv. BRRI dhan29). The effect of different levels of organic fertilizers in combination with recommended doses of inorganic fertilizers were tested over growth parameters and yield of rice.Among the yield contributing characters studied plant height, effective tillers hill-1, panicle length and filled grains panicle-1 were varied significantly by the different treatments. Most of the yield contributing characters influenced positively in treatment having quarter doses of cow dung, poultry manure and water hyacinth over recommended dose. The highest grain yield (5.58 t/ha)and straw yield (7.28 t/ha) were observed in that same treatmentT6 (1/3 Cow dung + 1/3 Poultry Manure + 1/3 water hyacinth + Fertilizers) over other treatments. Thus, the application of cow dung, poultry manure and water hyacinth with chemical fertilizers had significant and positive effect on N, P, K and S contents of rice. Sohel, M. H., Sarker, A., Razzak, M. A. & Hashem, M. A. (2016). Integrated use of organic and inorganic fertilizers on the growth and yield of Boro rice (CV. BRRI dhan 29). Journal of Bioscience and Agriculture Research, 10(01), 857-865. Sohel, M. H., Sarker, A., Razzak, M. A. & Hashem, M. A. "Integrated use of organic and inorganic fertilizers on the growth and yield of Boro rice (CV. BRRI dhan 29)". Journal of Bioscience and Agriculture Research, 10.01 (2016), 857-865. Sohel, M. H., Sarker, A., Razzak, M. A. & Hashem, M. A. Integrated use of organic and inorganic fertilizers on the growth and yield of Boro rice (CV. BRRI dhan 29). Journal of Bioscience and Agriculture Research, 10, no. 01 (2016), 857-865. Authors: Islam, M. M., Bashar, M. A., Akhter, N., Afroj, M., Rahman, M., Rahman, M. M. & Baque, M. A. Key Words: Participatory evaluation, Wheat genotypes and Tillage systems. Authors: Hossen, S. & Hossain M. K.
Key Words: Agar tress, Secondary products, Attar, Nailing, Raw materials and Perfume. Abstract: Tobacco is an important cash crop which is affected by different diseases in different stages of life cycle. For the control of these diseases different pesticides are used. In the present study Speight G-28 of FCV (Flue Cured Virgin) was grown in the experimental beds to evaluatethe effect of different fertilizers (i.e. Di Ammonium Phosphate, Ammonium Nitrate, Nitrophas, Super Phosphate, FYM and control) on the incidence of damping-off disease in tobacco nursery. Results showed the maximum disease was occurred in FYM (Farm Yard Manure) treated beds followed by super phosphate and the minimum disease were reported in DAP (Di Ammonium Phosphate) treated beds and followed by Nitrate. FYM was the primary source of infection causing damping-off disease. It was known that for the control of damping off disease there were many factors which were correlated to each other e.g. temperature, moisture, and soil nutrient. It was also observed that no seedlings were emerging in bed containing urea fertilizer due to ammonia gas formation which suppresses the seeds to germinate. Ali, S., Lina, W., Khan, N., Irshad, M. & Muhammad, Z. (2016). Effects of fertilizers on incidence of damping-off in nursery of flue cured virginia cv. speight g-28. Journal of Bioscience and Agriculture Research, 10(02), 877-885. Ali, S., Lina, W., Khan, N., Irshad, M. & Muhammad, Z. "Effects of fertilizers on incidence of damping-off in nursery of flue cured virginia cv. speight g-28". Journal of Bioscience and Agriculture Research, 10.02 (2016), 877-885. Ali, S., Lina, W., Khan, N., Irshad, M. & Muhammad, Z.​ Effects of fertilizers on incidence of damping-off in nursery of flue cured virginia cv. speight g-28. Journal of Bioscience and Agriculture Research, 10, no. 02 (2016), 877-885. Authors: Hossain, M. A., Alam, M. A. U., Khatun, M. U. S., Islam, M. K., Anwar, M. M. & Haque, M. E.
Abstract: The on-farm trial of BARI released lentil varieties was conducted at the MLT site, Ulipur, Kurigram during Rabi season of 2013-14 and 2014-15 in the Lentil-Sesame-Fallow cropping pattern in the Charland. The experiment was laid out in a randomized complete block design with six dispersed replications. Four variety viz., BARI Masur-4, BARI Masur-5, BARI Masur-6 and BARI Masur-7 with local cultivar were compared for this purpose. Among the tested varieties, BARI Masur-7 gave the highest yield in both year (1.43 and 1.40 t/ha) which differed significantly from other varieties and the lowest yield was recorded from local (0.860 and 0.834 t/ha). The highest gross return (Tk. 114240 and 112000 ha-1) and gross margin (Tk. 81940 and 77160 ha-1) were obtained from BARI Masur-7 in two consecutive Rabi season. The lowest gross return (Tk. 68800 and 66720 ha-1) and gross margin (Tk. 36500 and 31880 ha-1) were obtained from the local cultivar. The lentil production was profitable to the farmers in the study areas with BARI released lentil varieties. Hossain, M. A., Alam, M. A. U., Khatun, M. U. S., Islam, M. K., Anwar, M. M. & Haque, M. E. (2016). Performance of BARI released lentil varieties in charland ecosystem under Kurigram district. Journal of Bioscience and Agriculture Research, 10(02), 886-891. Hossain, M. A., Alam, M. A. U., Khatun, M. U. S., Islam, M. K., Anwar, M. M. & Haque, M. E. "Performance of BARI released lentil varieties in charland ecosystem under Kurigram district". Journal of Bioscience and Agriculture Research, 10.02 (2016), 886-891. Hossain, M. A., Alam, M. A. U., Khatun, M. U. S., Islam, M. K., Anwar, M. M. & Haque, M. E. Performance of BARI released lentil varieties in charland ecosystem under Kurigram district. Journal of Bioscience and Agriculture Research, 10, no. 02 (2016), 886-891. Abstract: An experiment was carried out at the on station research field of Agricultural Research Station, On-farm Research Division, Rangpur during 2014-15 and 2015-16 to investigate the effect of integrated nutrient management on the yield and quality of sweet pepper. There were six treatments: T1 = 100% RD (N115P70K125S20Zn2 kg ha-1), T2 = 75% RD + 5 tha-1 CD, T3 = 75% RD + 5 tha-1 CD Slurry, T4 = 75% RD + 3 tha-1 PM, T5 = 75% RD + 3 tha-1 PM Slurry, T6 = Native fertility. The tested variety was BARI Misti Morich-1. The experiment was laid out in randomize complete block design with 3 replications. Results revealed that the T5 (75% RD+ 3 tha-1 PM Slurry) produced the highest fruit yield (25.29 & 23.55 tha-1) and the lowest yield (16.34 & 17.10 tha-1) was in control treatment (native fertility). An inclusion of 3 t PM Slurry ha-1 with 75% RD can reduce 25% of chemical fertilizer. Integrated use of PM Slurry at the rate of 3 tha-1 with 75% RD was found as the best combinations in respect of sweet pepper yield and probable of enriching the soil organic matter. Sultana, M. M., Haque, M. A., Begum, R. A., Islam, M. K., Hossain, M. A. & Anwar, M. M. (2016). Effect of integrated nutrient management on yield and quality of sweet pepper. Journal of Bioscience and Agriculture Research, 10(02), 892-898. Sultana, M. M., Haque, M. A., Begum, R. A., Islam, M. K., Hossain, M. A. and Anwar, M. M. “Effect of integrated nutrient management on yield and quality of sweet pepper”. Journal of Bioscience and Agriculture Research, 10.02(2016): 892-898. Sultana, M. M., Haque, M. A., Begum, R. A., Islam, M. K., Hossain, M. A. and Anwar, M. M. “Effect of integrated nutrient management on yield and quality of sweet pepper”. 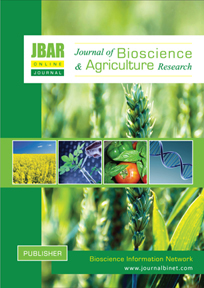 Journal of Bioscience and Agriculture Research, 10 no.02(2016): 892-898. Authors: Hossain, M. A., Alam, M. A. U., Khatun, M. U. S., Islam, M. K., Anwar, M. M. and Haque, M. E.